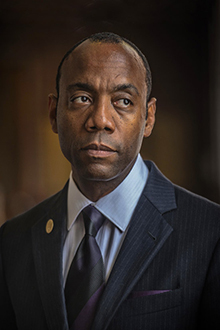 Cornell Brooks, president and CEO of the NAACP, visits Emory Law on Jan. 12 to discuss “Why We Can’t Wait: Civil Rights on the Eve of the Trump Inauguration." Photo by the Washington Post; courtesy of NAACP. Cornell Brooks, president and CEO of the National Association for the Advancement of Colored People (NAACP), will give a lecture Thursday, Jan. 12, in celebration of Martin Luther King Jr. Day at Emory Law. In conjunction with the Black Law Students Association, Emory Law will host the lecture titled “Why We Can’t Wait: Civil Rights on the Eve of the Trump Inauguration” at 6:30 p.m. at Tull Auditorium, Gambrell Hall. Brooks’ lecture will be followed by a reception in Hunter Atrium. Free parking will be available after 4 p.m. in the Lowergate South Parking Deck, 1705 Lowergate Drive. RSVP here. Founded in 1916, Emory University School of Law is an American Bar Association nationally accredited law school. Consistently ranked as one of the premier law schools in the United States, Emory Law offers exceptional doctrinal and practical legal education with signature programs in advocacy, transactional law, technology and IP law, law and religion, and vulnerability studies.